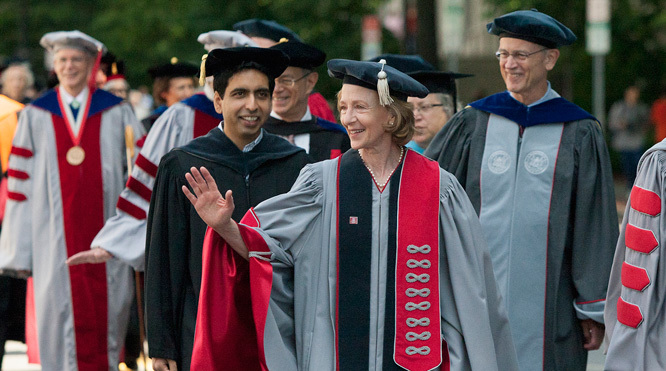 President Susan Hockfield makes her way — with other administrators and Commencement speaker Sal Khan ’98, MEng ‘98 (background, in black robe) — down Massachusetts Avenue and into Killian Court for MIT's 146th Commencement exercises. 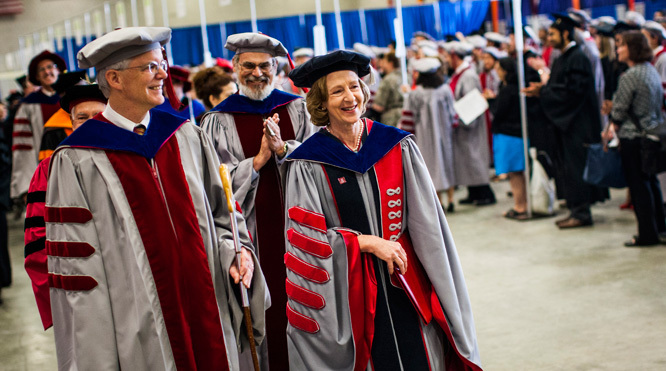 President Susan Hockfield enters Rockwell Cage with other administrators for the hooding ceremony for doctoral students. 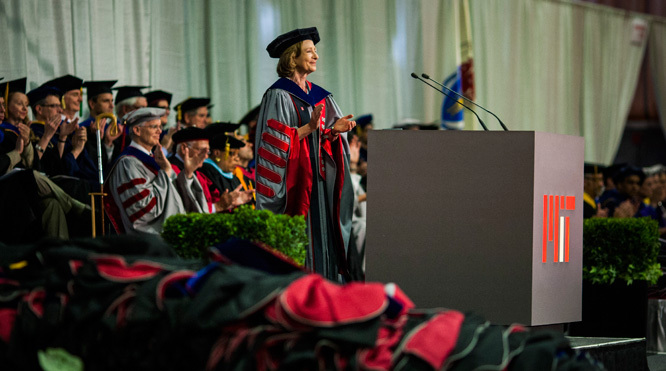 President Susan Hockfield delivers her address during the hooding ceremony for doctoral students. Aalap Dighe, left, the vice president of the Graduate Student Council, and TyShaun Wynter, former president of the Undergraduate Association, present President Susan Hockfield with a brightly colored vase from MIT's Glass Lab at the Hockfield Day celebration on May 17. 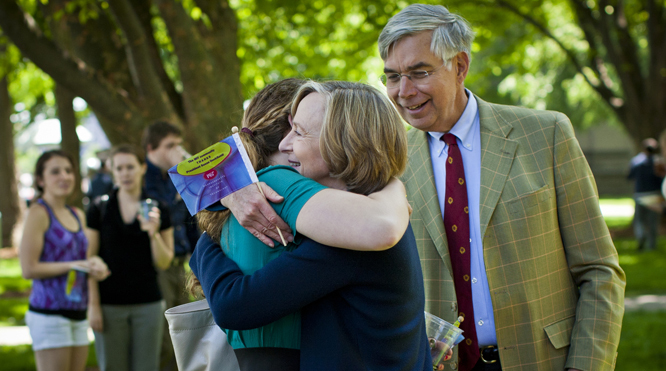 Hockfield and her family, including husband, Dr. Thomas Byrne, and daughter, Elizabeth Byrne, share a moment at Hockfield Day on May 17. 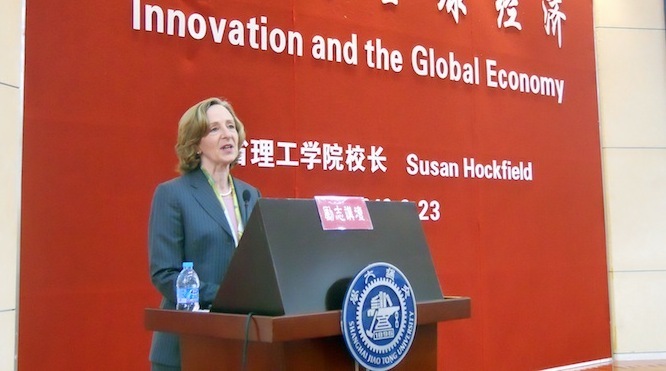 The event celebrated Hockfield's service to the Institute over her presidency. 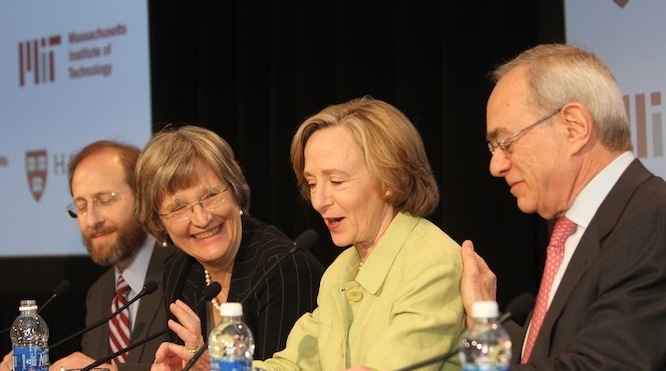 (From left), Harvard Provost Alan Garber, Harvard President Drew Faust, MIT President Susan Hockfield and MIT Provost L. Rafael Reif at Wednesday morning's press conference after announcing edX. 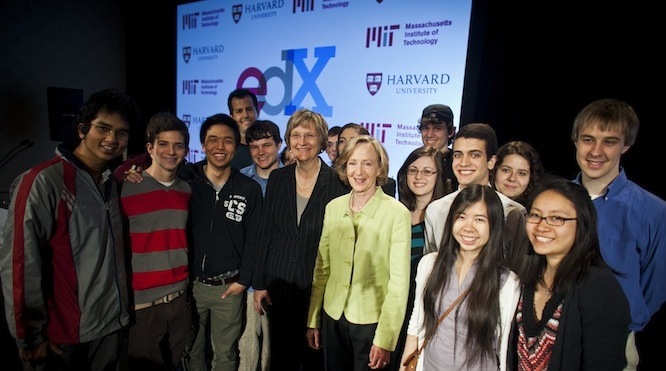 President Susan Hockfield (in green) and Harvard President Drew Faust are joined by students from both universities at the edX announcement. 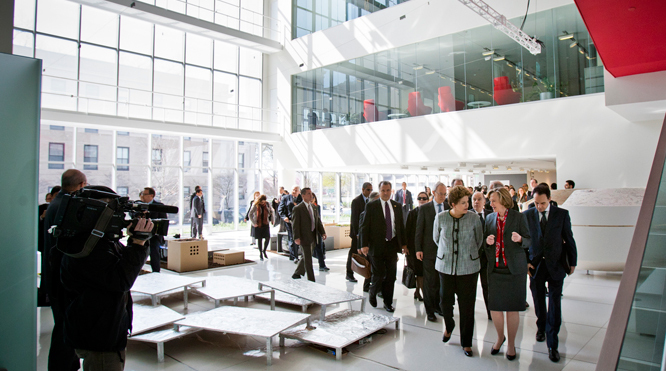 On Tuesday, April 10, MIT welcomed Brazilian President Dilma Rousseff to the MIT Media Lab. 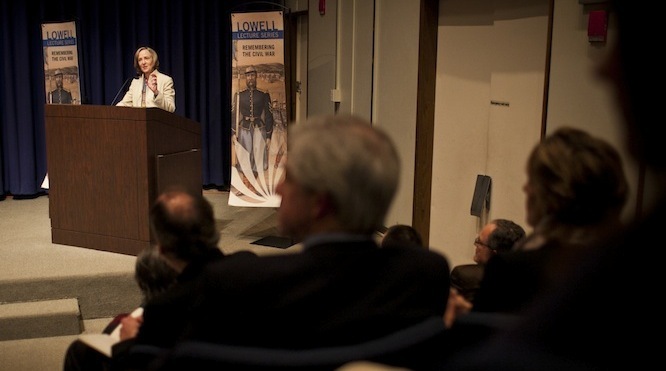 President Susan Hockfield delivers a lecture at the Boston Public Library as part of the Lowell Lecture Series which commemorated the 150th anniversary of the Civil War. 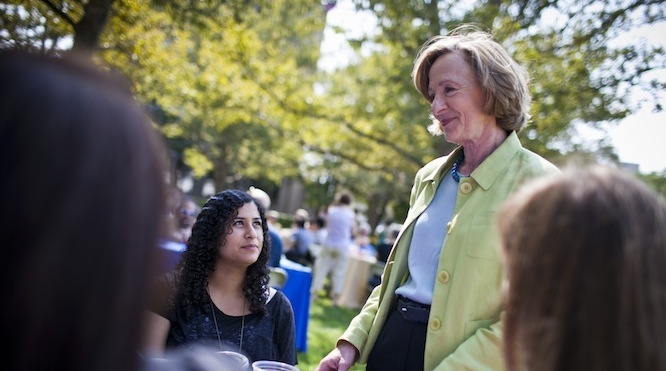 President Susan Hockfield talks with students during a community picnic to celebrate the opening of Maseeh Hall. 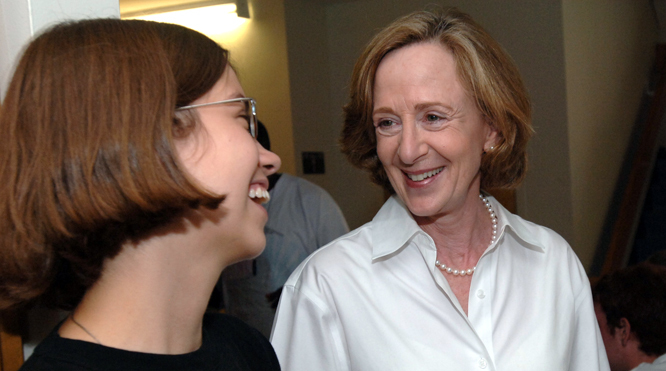 President Susan Hockfield talks with students during the community picnic to celebrate the opening of Maseeh Hall. 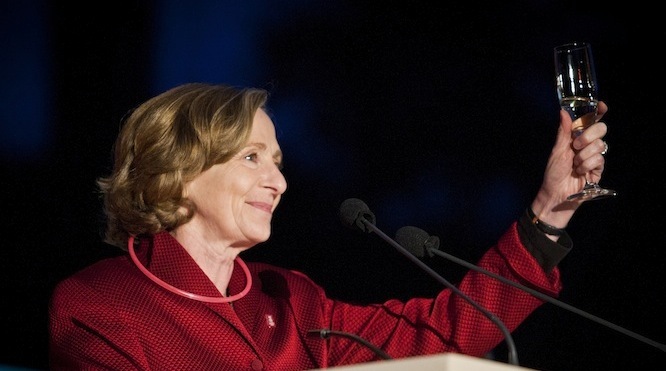 President Susan Hockfield toasts the Institute at the Toast to the Tech 2011, the culmination of MIT's sesquicentennial celebration. 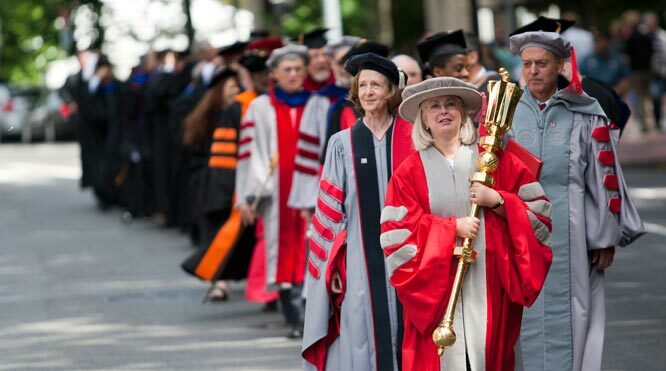 President Hockfield and other MIT administrators, faculty and guests are led down Massachusetts Avenue for the 2011 Commencement ceremonies. 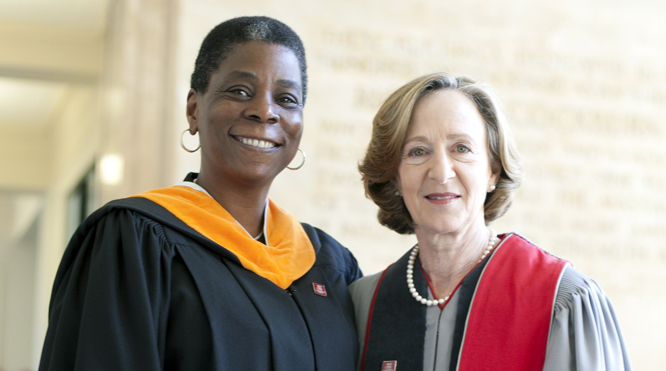 Xerox CEO Ursula Burns, left, with President Hockfield. Burns was MIT's Commencement speaker for 2011. 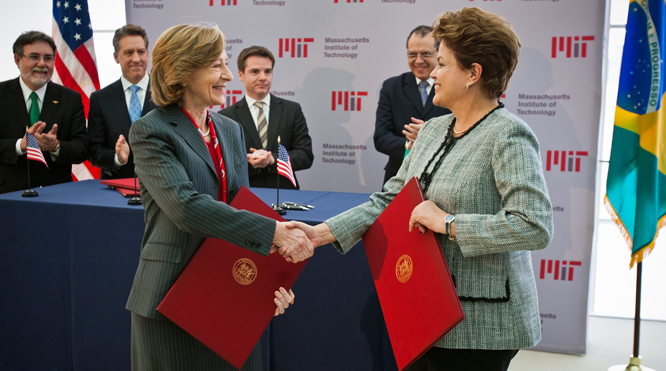 President Hockfield hands out diplomas to MIT graduates on June 3, 2011. 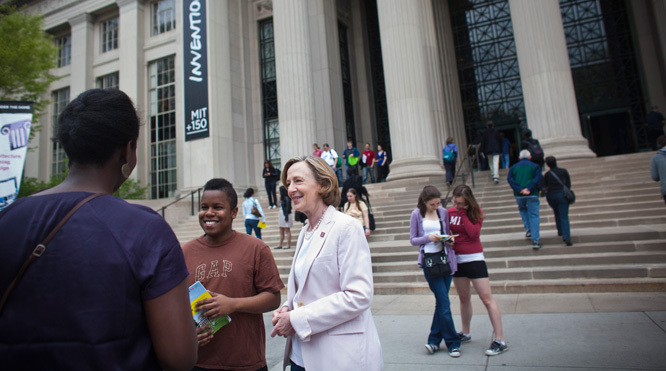 President Hockfield talks to students during the MIT Open House. 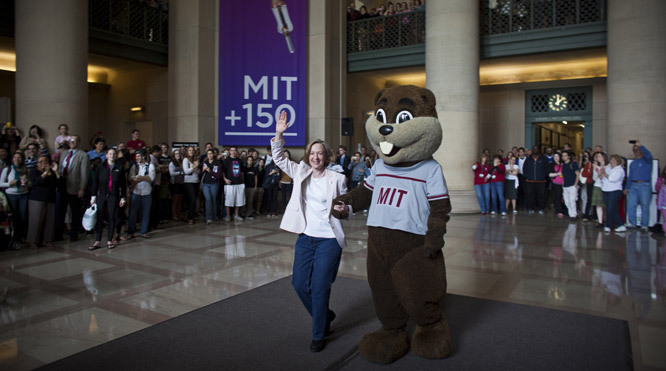 Hockfield and MIT's mascot, Tim the Beaver, participate in a flash mob at the MIT150 Open House. 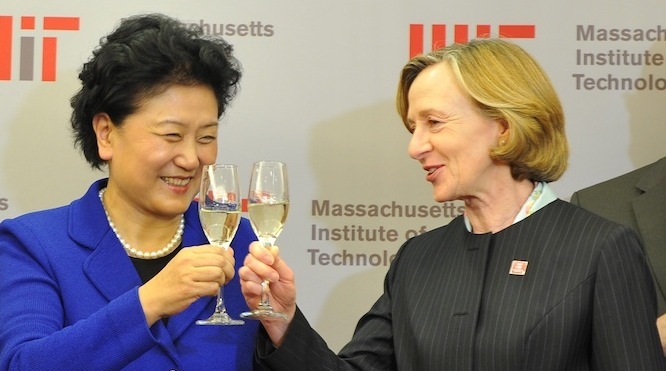 Madame Liu Yandong, State Councilor of the People’s Republic of China, and MIT President Susan Hockfield celebrate the signing of an agreement to encourage collaboration between MIT and Shanghai Jiao Tong University and establish a fellowship program with the China Scholarship Council to sponsor students from China to study at MIT. 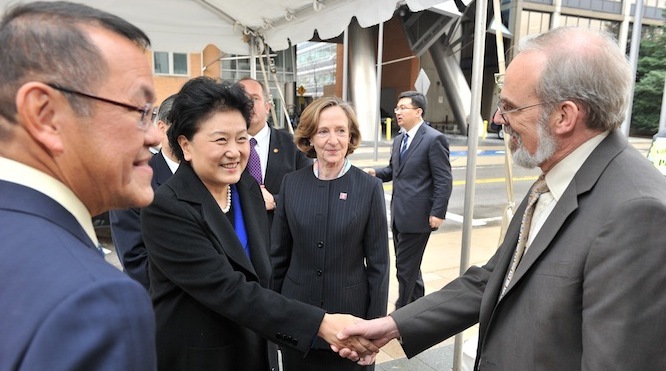 (From left), CSAIL Director Victor Zue, Madame Liu Yandong, President Hockfield and Chancellor Eric Grimson. 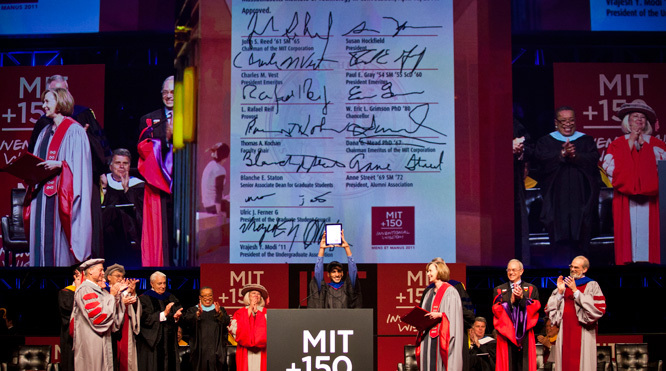 The 'iCharter' signed by representatives of the MIT community during the MIT150 Convocation. 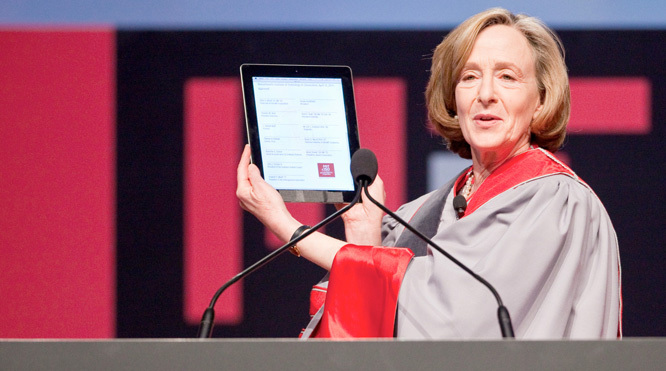 President Hockfield holds up the iCharter. 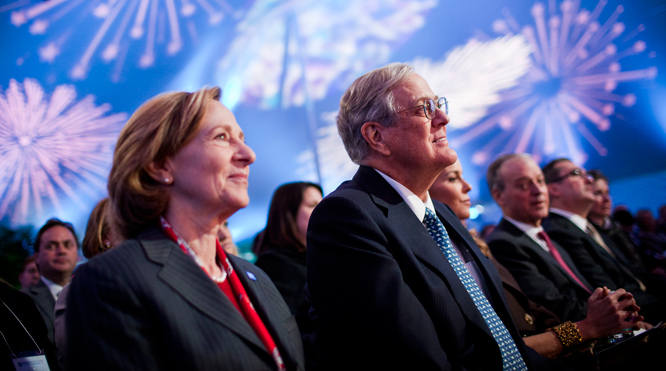 Susan Hockfield and David H. Koch at the March 4, 2011, dedication of the Koch Institute for Integrative Cancer Research. 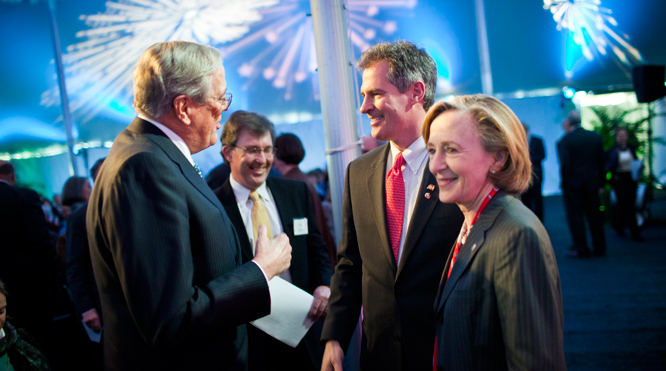 Susan Hockfield, David H. Koch, U.S. Sen. Scott Brown and Tyler Jacks at the March 4, 2011, dedication of the Koch Institute for Integrative Cancer Research. 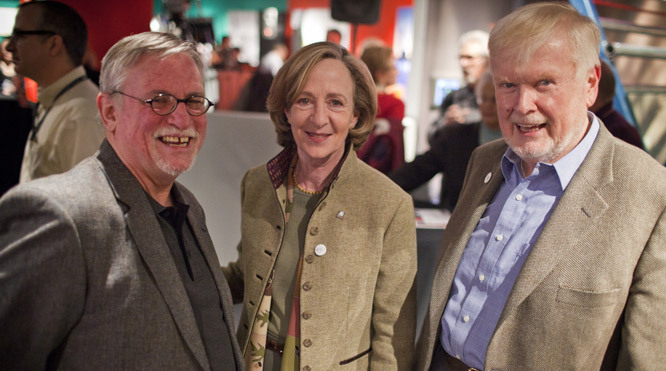 President Hockfield and guests at the MIT150 kickoff at the MIT Museum. 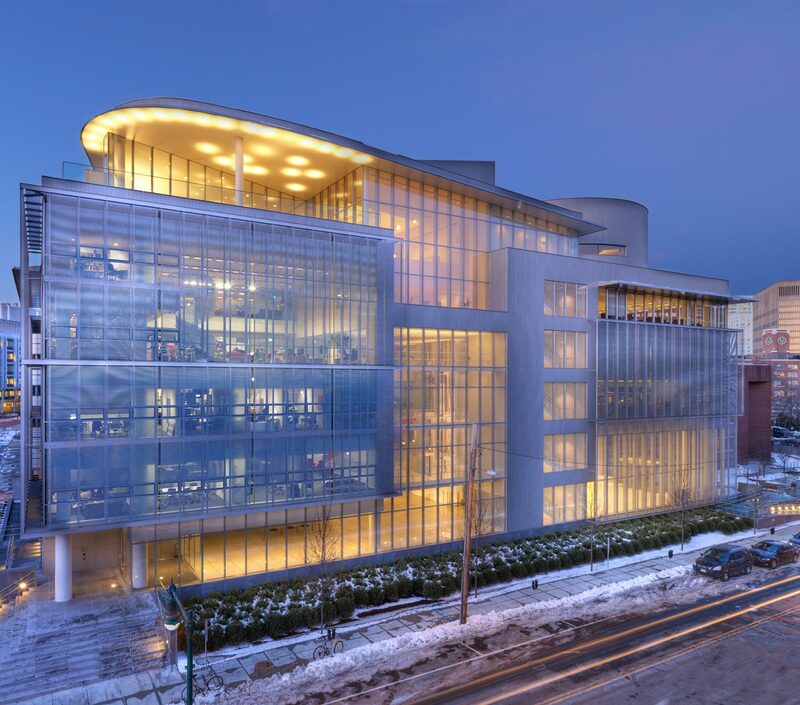 President Hockfield addresses attendees at the MIT Museum kickoff for MIT's 150th anniversary. 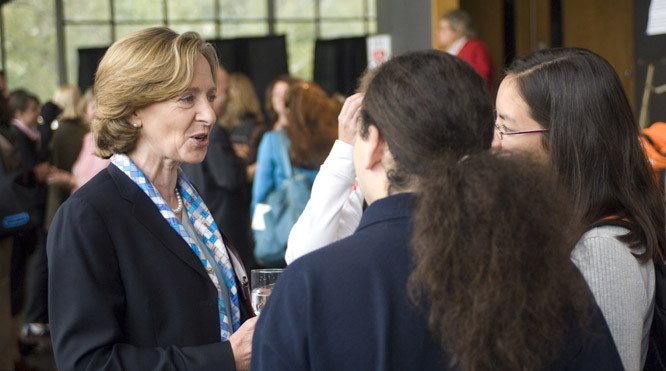 President Hockfield talks to community members after the annual State of the Institute address. 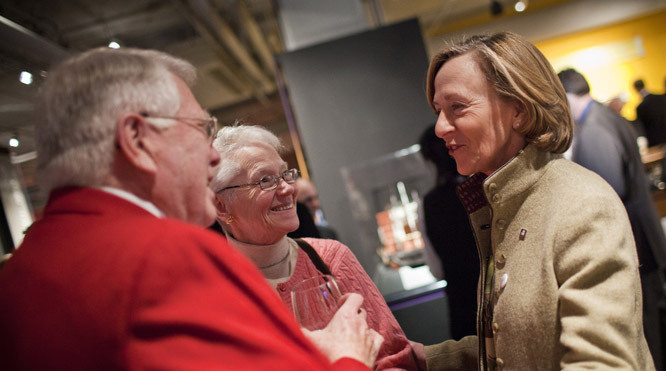 President Hockfield talks with community members after the annual State of the Institute address. 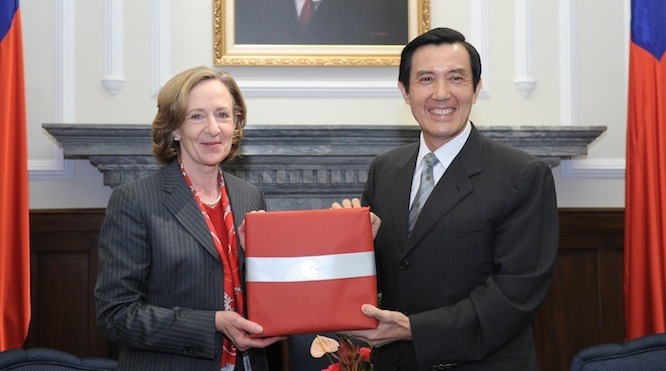 President Hockfield meets Taiwanese President Ma Ying-jeou in Taipei. 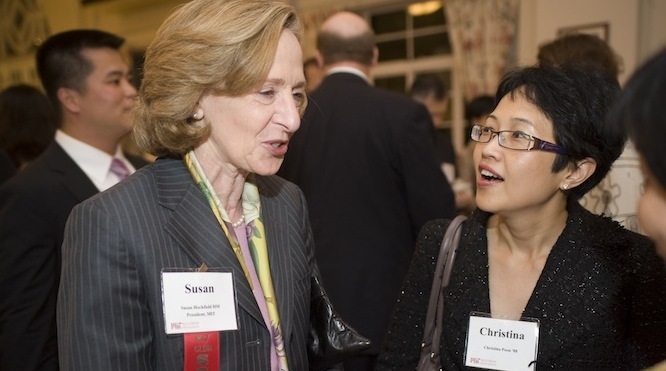 President Hockfield talks to alumni at the MIT Club of Hong Kong. 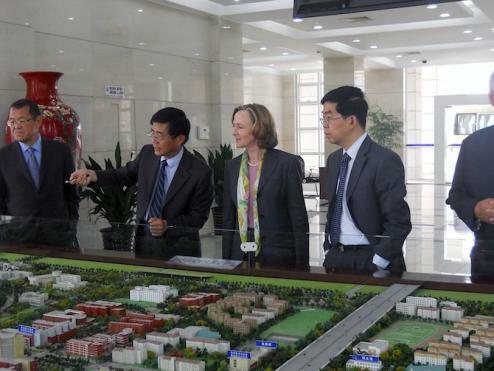 President Hockfield receives an overview of the Shanghai Jiao Tong University campus. Standing next to Dr. Hockfield on the right is SJTU Vice President Huang Zhen. 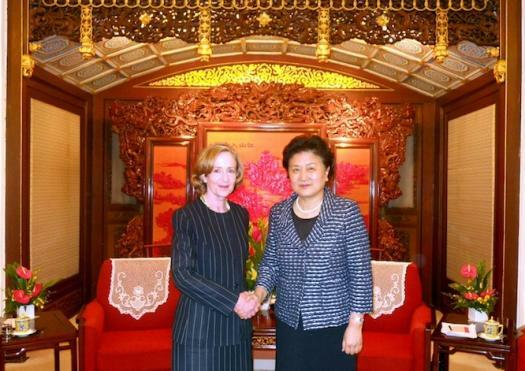 President Hockfield meets with Madame Liu Yandong, state councilor and member of the Political Bureau of the Communist Party of China Central Committee at the party's central headquarters in the Zhong Nan Hai area of Beijing. 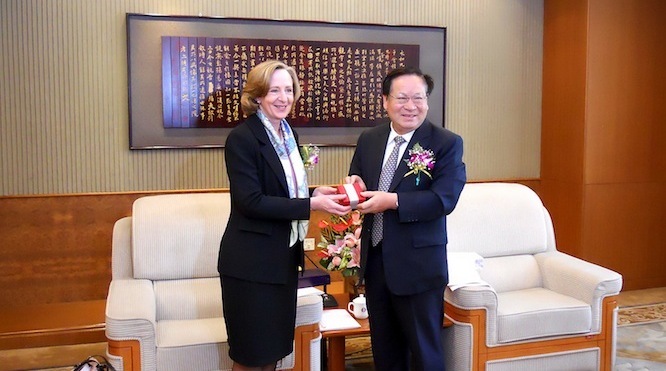 President Hockfield meets Professor Binglin Gu, president of Tsinghua University, during a trip to China. 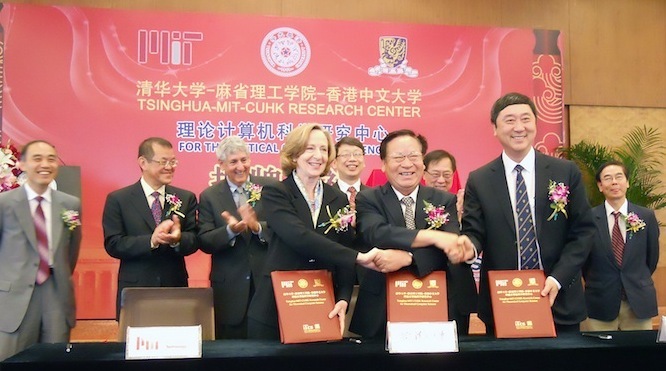 President Hockfield participates at a signing ceremony for an agreement to create the Tsinghua-MIT-Chinese University of Hong Kong (CUHK) Joint Center for Theoretical Computer Science. Standing next to President Hockfield, from left, are Tsinghua University President Binglin Gu and CUHK Chancellor Designate Joseph JY Sung. 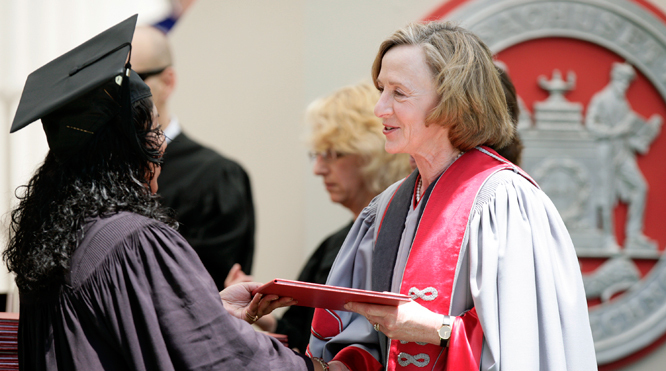 Susan Hockfield hands out a diploma to a new graduate at the 2010 Commencement exercises. 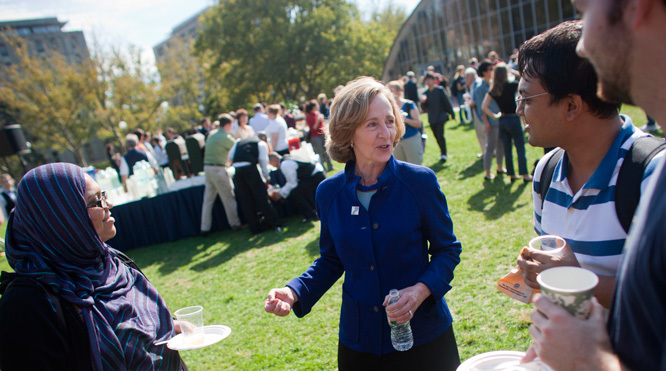 President Hockfield talks with students during one of the Institute's annual community picnics. 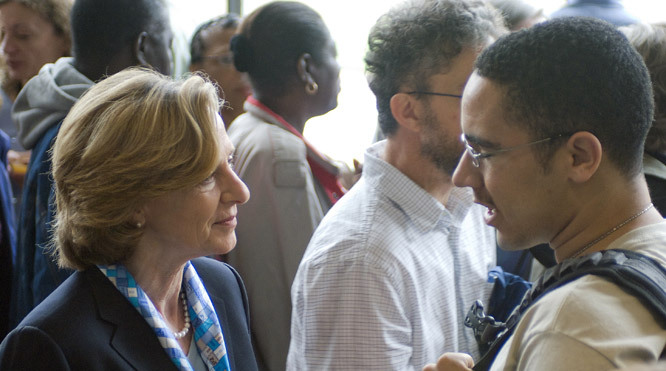 President Hockfield and Professor Vladimir Bulovic listen as President Barack Obama talks during a visit to MIT. 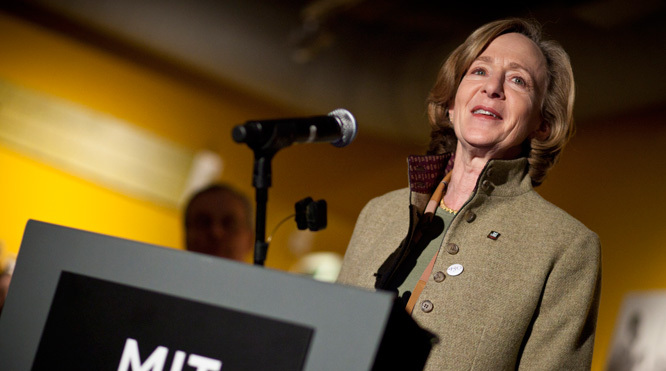 Susan Hockfield chats with Massachusetts Gov. 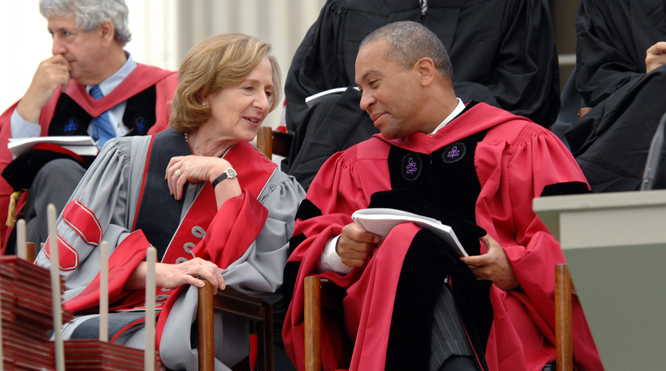 Deval Patrick, the keynote speaker at the 2009 Commencement exercises. 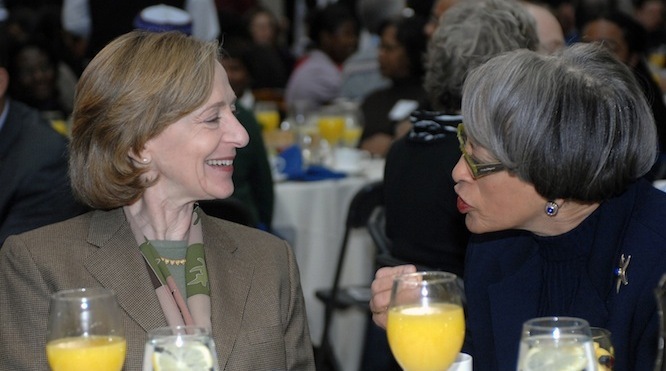 President Susan Hockfield talks with 2009 Martin Luther King, Jr. Celebration keynote speaker Dr. Johnnetta B. Cole. 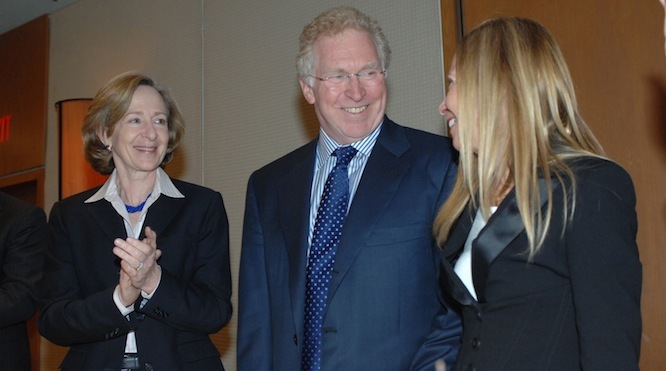 President Hockfield with Phillip and Susan Ragon at the announcement of the Ragon Institute of MGH, MIT and Harvard. 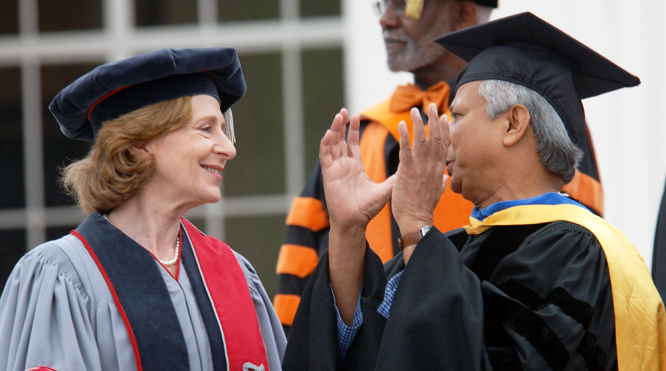 Susan Hockfield and Muhammad Yunus talk prior to the 2008 Commencement exercises, where Yunus was the keynote speaker. 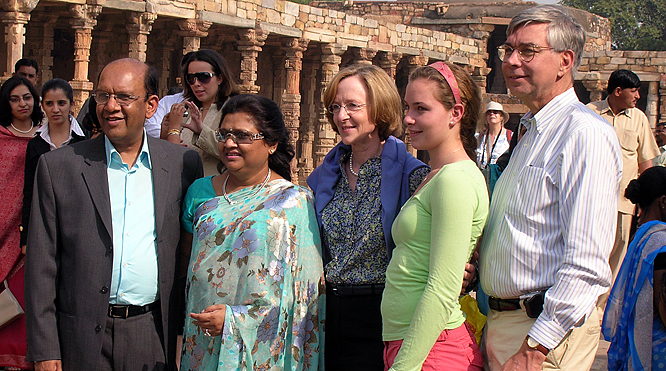 On Nov. 16, MIT President Susan Hockfield led a delegation on a weeklong trip to India, highlighting MIT's history with India and the potential for future collaborations. 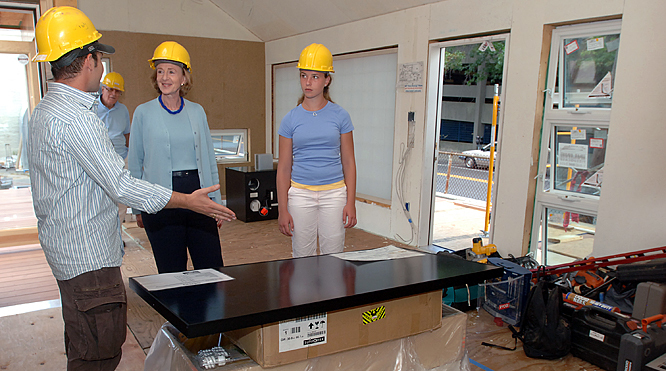 Corey Fucetola, graduate student in elecrical engineering and computer science, gives President Susan Hockfield, and her daughter Elizabeth, a tour of the solar house being built at the corner of Albany and Portland streets. 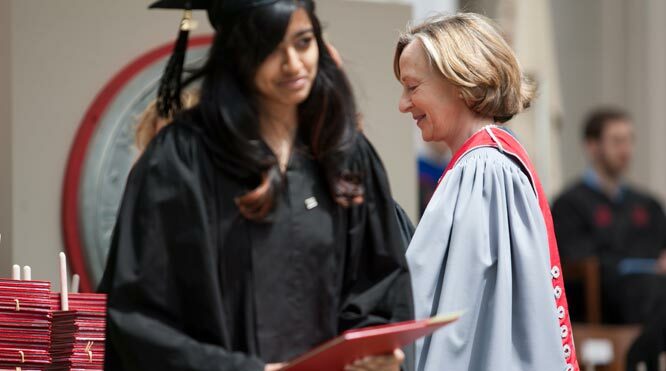 Incoming freshman Mary Masterman of Oklahoma shares conversation with President Susan Hockfield at her visit to International House after Freshman Convocation. 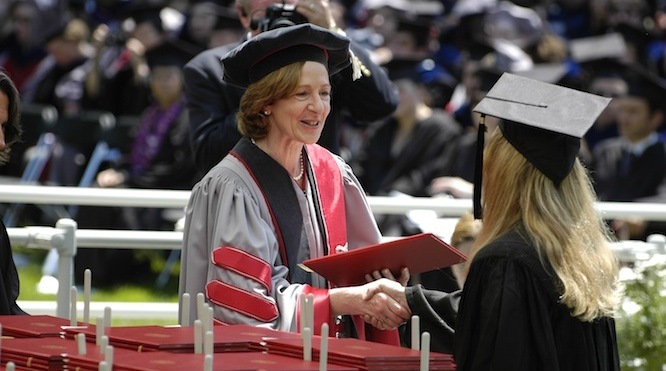 President Hockfield hands out diplomas to MIT graduates at Commencement in 2007. 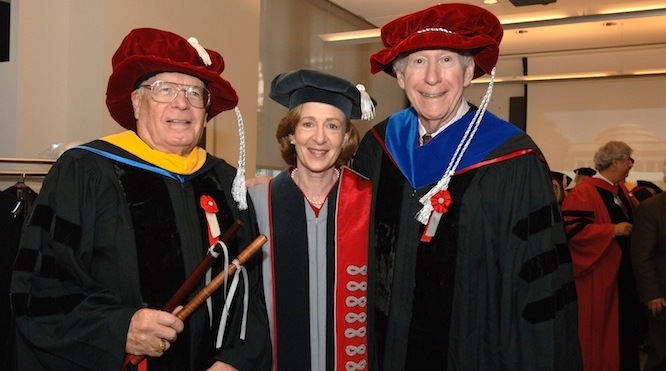 President Susan Hockfield (center) with MIT Corporation members Alex Dreyfoos (left) and Ronald Kurtz (right), at Commencement 2007. 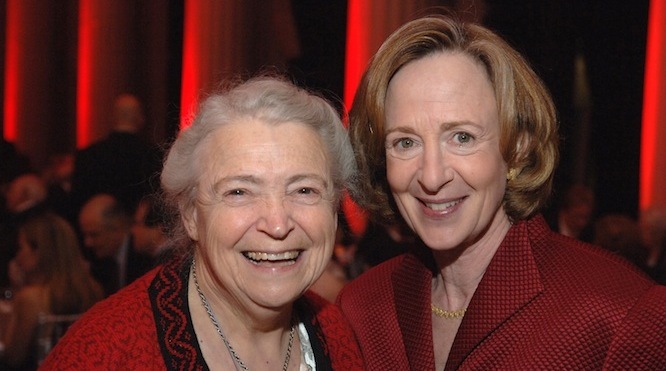 Professor of Physics and Electrical Engineering, Emerita Institute Professor Mildred (Millie) Dresselhaus, left, with President Hockfield at an event in September 2006. 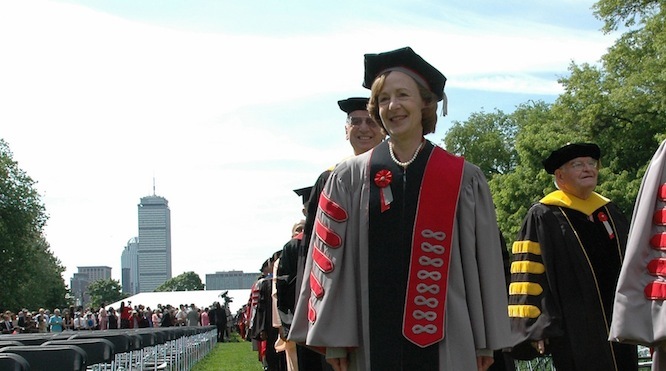 President Susan Hockfield marches into Killian Court with MIT administrators and faculty during Commencement 2005. 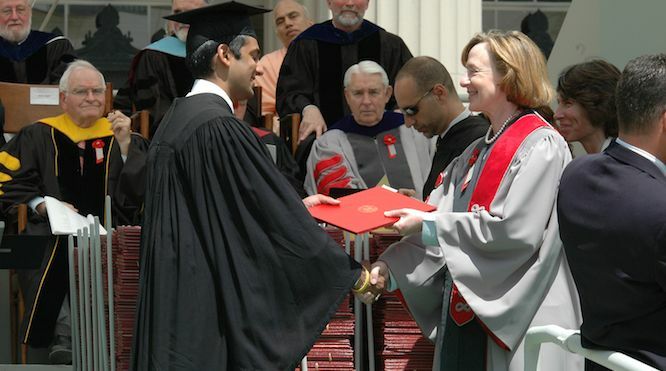 Class of 2005 President Rohit Gupta receives his diploma from President Susan Hockfield during commencement.